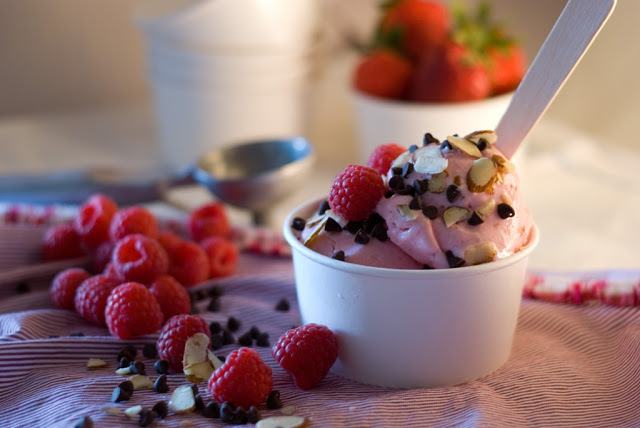 Am I the only one that craves Red Mango, Pink Berry, Menchies, or any Fro-yo around 9:00 p.m. almost EVERY night? 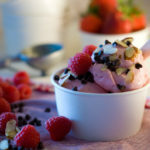 I love the tartness of the frozen yogurt topped with my “usual” toppings of berries, chocolate chips and almonds. One night realized that I had a quart of Greek yogurt in my refrigerator. I had fresh berries and, of course, I always have chocolate chips and nuts just hanging around the kitchen and other parts of my house. Why not make my own version? The entire process was complete in less than 30 minutes. Quicker than driving to the closest froyo location, cheaper, probably healthier AND I didn’t have to make up an excuse why I was leaving in my p.j.s with my purse at 10:00 p.m. There are frozen yogurt businesses popping up everywhere. This is the bait and hook: 1) the sign says “Yogurt”, 2) free samples of a dozen different flavors of yogurt 3) self serve soft serve yogurt, 4) add your own toppings 5) one flat fee charged generally by the ounce or pound. Then they only have paper bowls that will hold a gallon of yogurt. I can feed my entire family with the amount of yogurt and toppings that just one of those containers can hold. Doesn’t matter. It’s yogurt and berries, which means I can eat all I want. No limit’s. It’s like eating at Whole Foods. Doesn’t matter what it is. I have decided if it’s sold at Whole Foods, it’s healthy, free of calories and I can eat all I want. Including Gelato!! Wash and prepare berries. I’m using 1 1/2 cups raspberries and 1 1/2 cups strawberries. 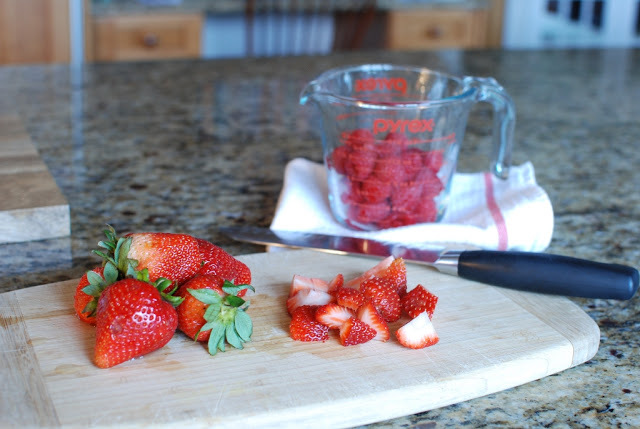 Place the berries in a food processor fitted with a metal blade. Pulse until you have reached your desired consistency. 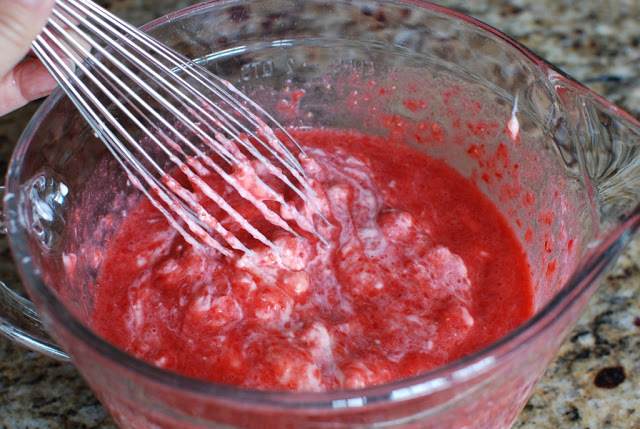 You can leave the berries whole, chunky or puree them. 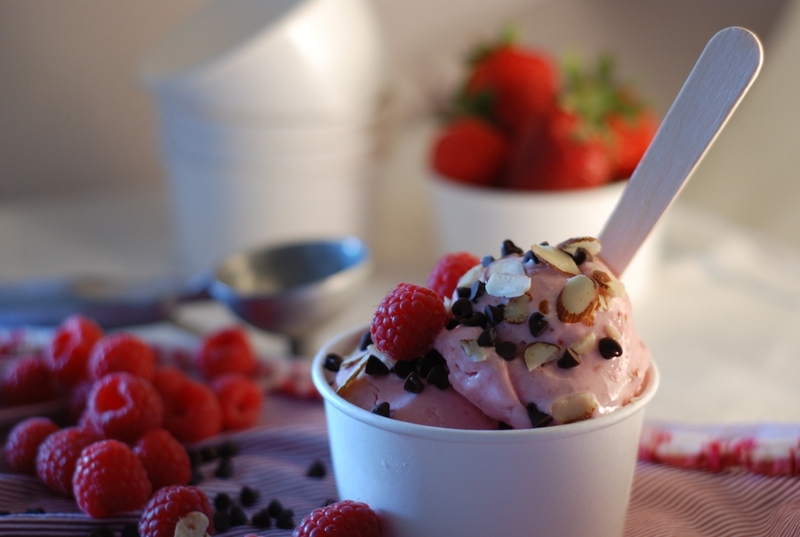 Your frozen yogurt – your choice. Sweetener, of course, is optional. By berries are a bit tart so I’m adding 2 tablespoons honey. 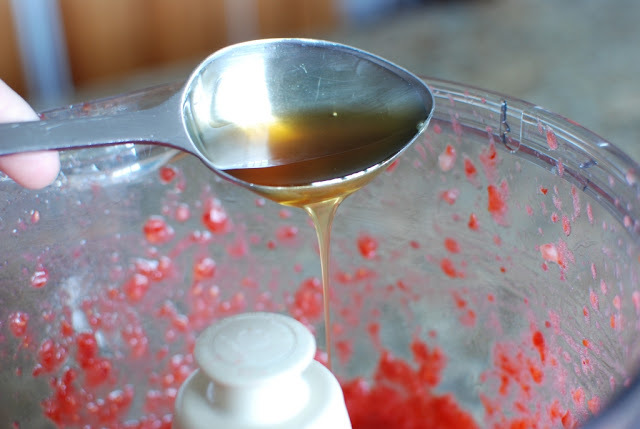 You can use sugar or any other sweetener you would like. I’m sure you wouldn’t use an artificial sweetener…right? 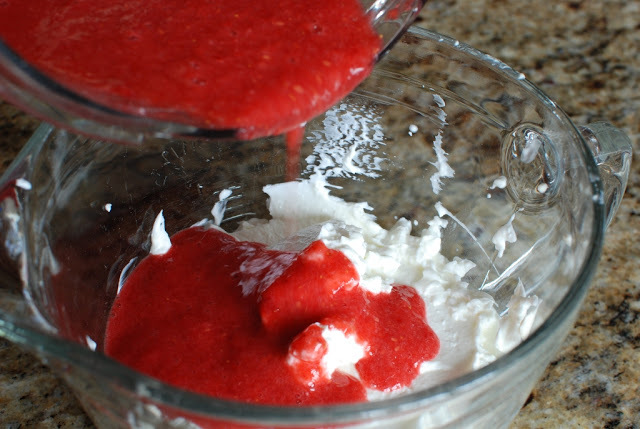 Add the honey to the fruit and pulse just a few more times to blend. 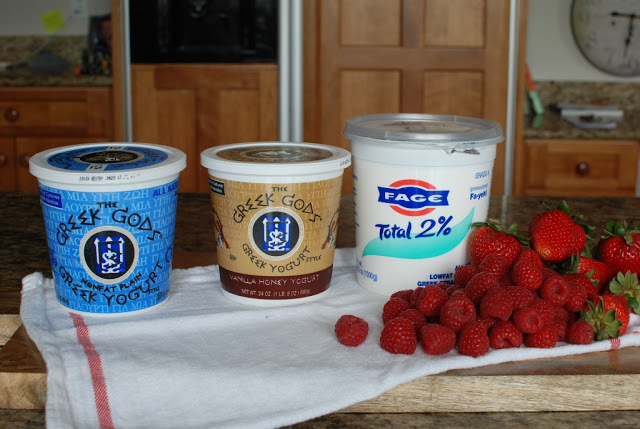 Let’s talk yogurt. Once again use what brand you like. 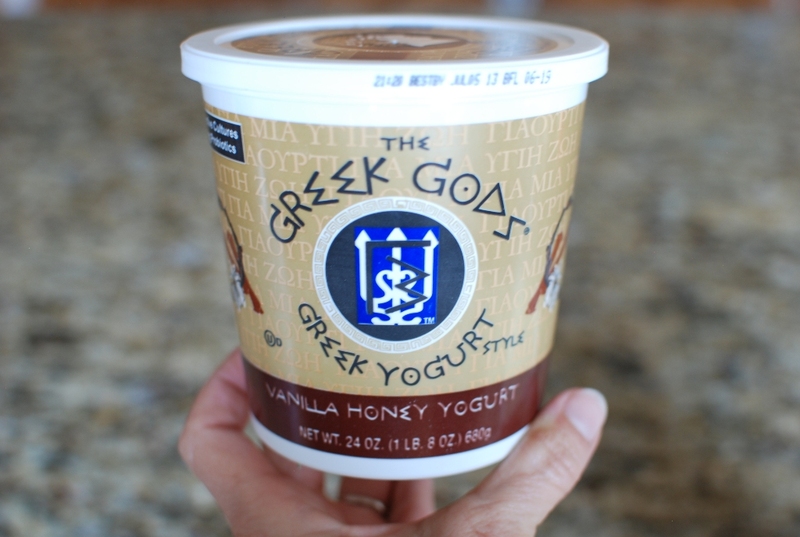 Have you every tried The Greek Gods Vanilla Honey Yogurt? Oh. My. Gosh. Amazing. It’s like eating cheesecake. This just happens to be full fat and divine. This makes amazing frozen yogurt. 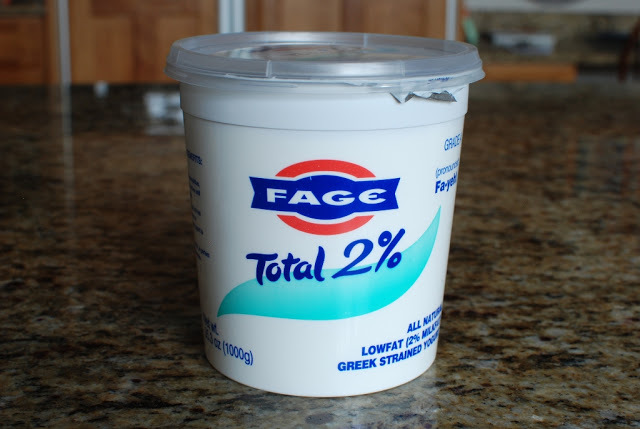 I just love the tartness of plain yogurt. You can choose your fat level. 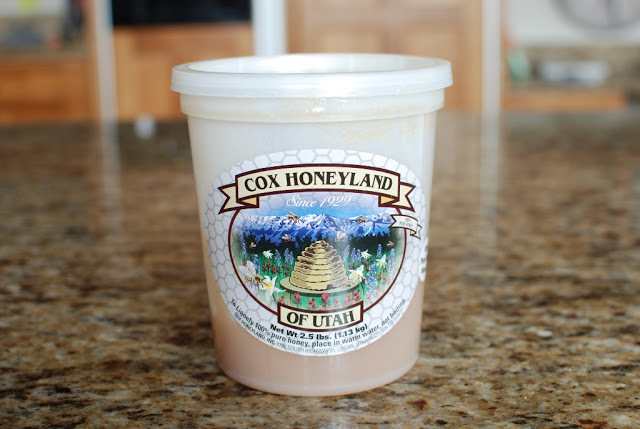 If I’m making this for just me I use 0% fat and not sweeteners what so ever. If I’m trying to convince my family that it’s just regular ice cream I use sweetener and whole or 2% fat. You choose. Measure 3 cups Greek yogurt into a large bowl. Taste the mixture. Does it have the tartness/sweetness you desire? If not add more honey. 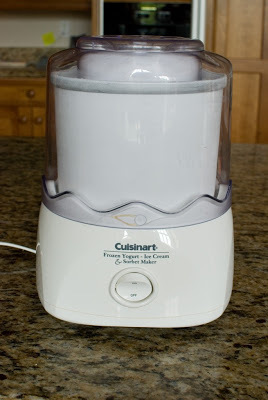 I’m using my table top ice cream maker. I love this machine. I have two. 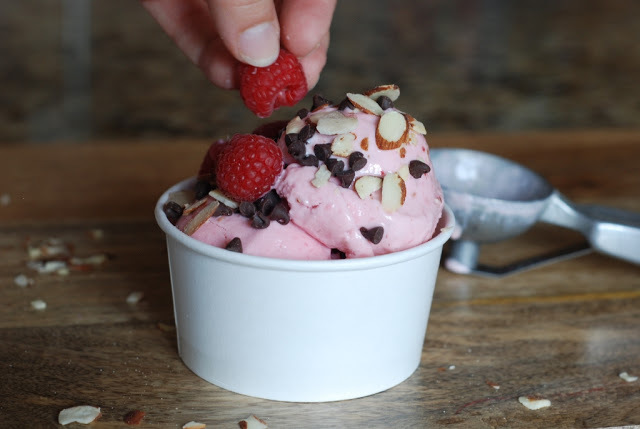 Hint: Make sure the ice cream bowl has been in the freezer for at least 24 hours. 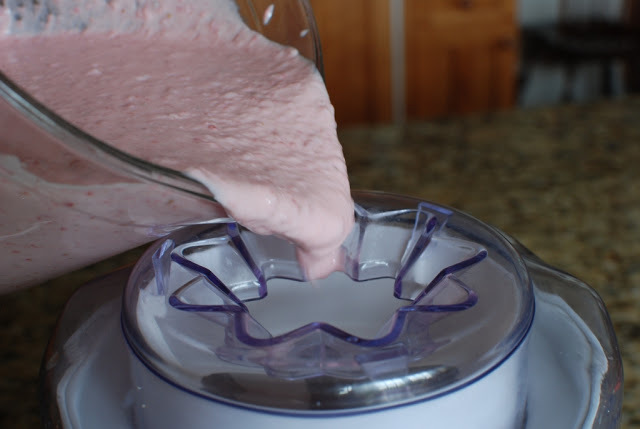 Pour the yogurt mixture into the ice cream maker. 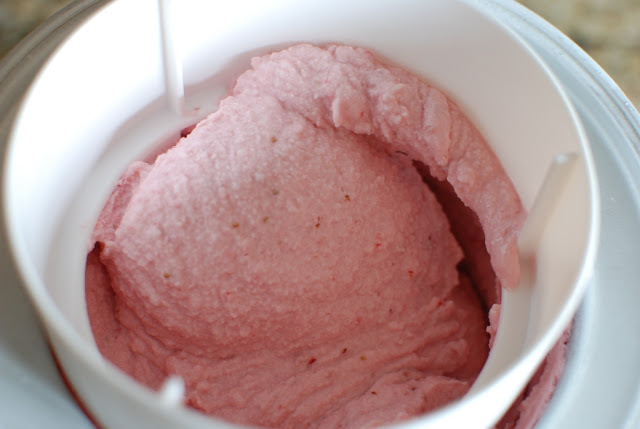 Let machine churn for about 20-25 minutes. DO NOT go longer than 30 minutes. If you do, the frozen bowl begins to thaw and so will your frozen yogurt. 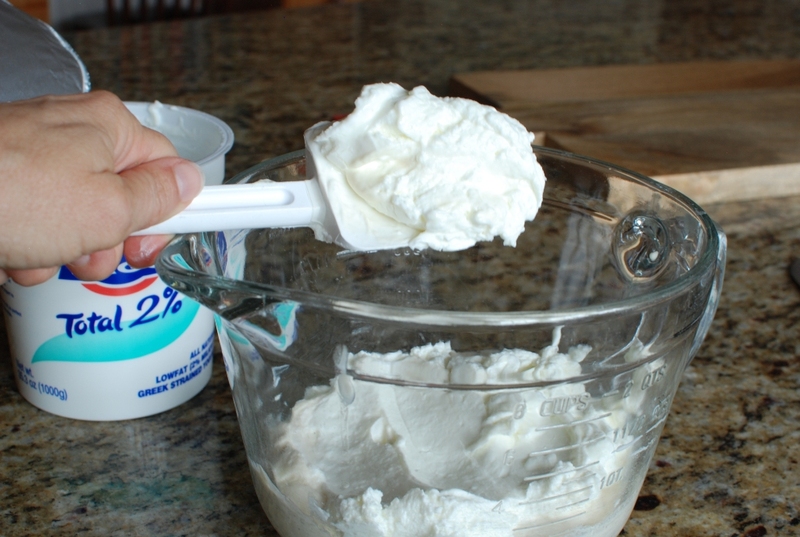 Remove the center dasher. Lick it clean. NOTE: I like to serve immediately. I tell you why. 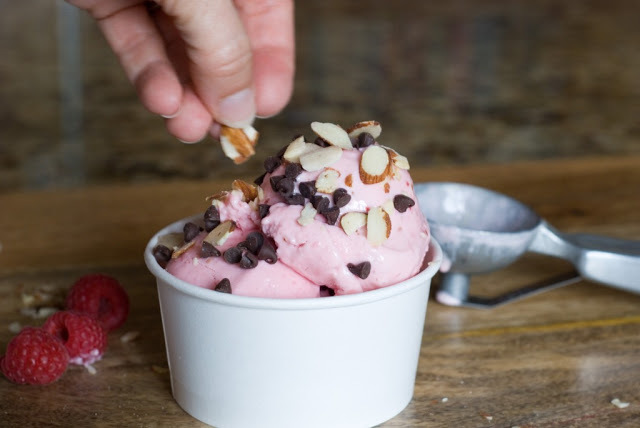 This frozen yogurt will freeze harder than concrete. 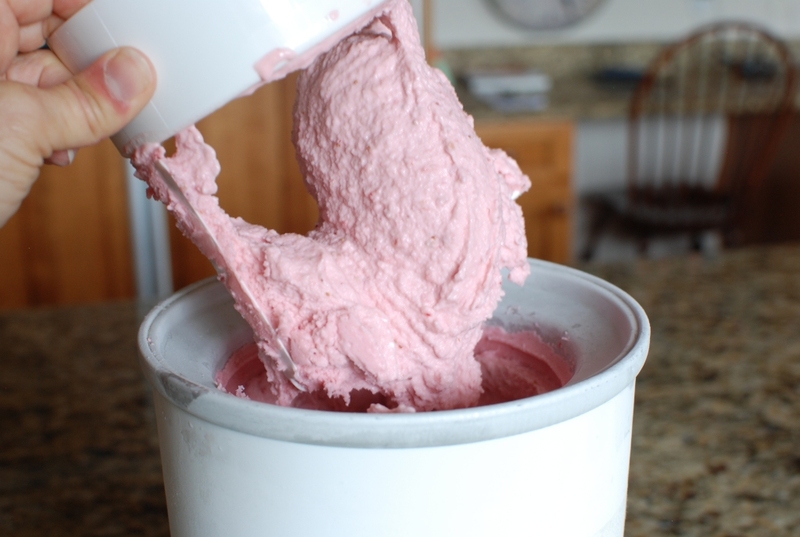 You can make it ahead and place it in the freezer, but you will need a jackhammer to scoop it up. I have removed it from the freezer up to 30 minutes in advance and still had a hard time scooping. You have been warned. This is how I HAVE to eat my berry froyo – topped with mini semi-sweet chocolate chips. Topped with a few fresh berries. Perfect for my nightly sweet fix. Of course you can choose your own fruit variations. Let your imagination run wild. 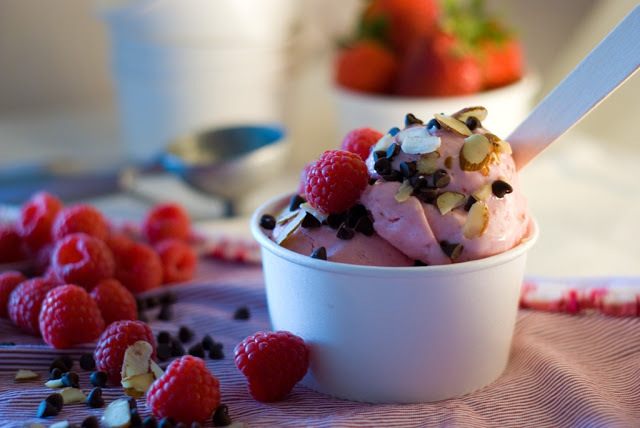 Frozen yogurt is nothing more than your favorite yogurt with your fruit of choice. It's so good and refreshing. 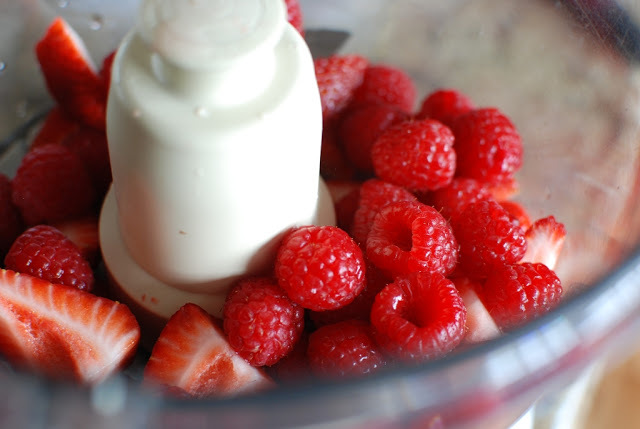 Mix all ingredients together in a large bowl. Pour into a 1 1/2 - 2 quart ice cream maker. Freeze according to manufacturers directions. Makes 1 1/2 quarts or enough to feed me. Okay, this looks totally divine and drool-worthy! Bring on summer! A recipe that doesn't drool onto the hips. I'm so ready for summer. waaaay better than ice cream! Your photo are just wonderful, making me feel like I could actually do this. Thank you. You CAN do this recipe. I'm so jealous you have strawberries. Home grown have amazing flavor that can't be compared to. Thanks so much for commenting. There seems to be a new frozen yogurt spot every weekend in my neighborhood. Why pay exorbitant amounts of money when I can make it at home. This looks fantastic! Thanks for your comment. I hope you love the fro-yo. I found one of mine at a thrift store for $8. What a find. I hope you find one. Great post! Perfect for spring/summer and super easy. I love all the colors in your photo, wait a minute… is that my shirt? 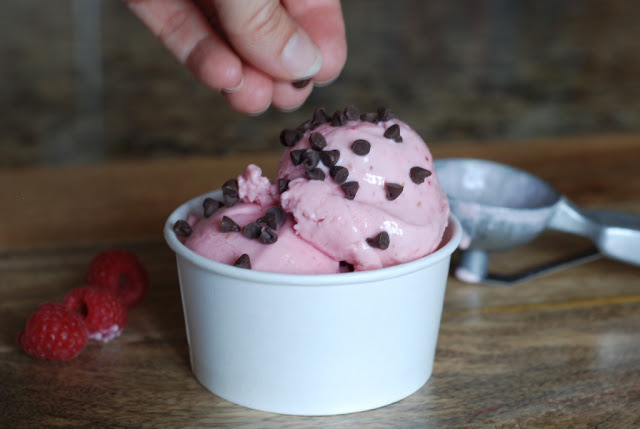 You want to know my lazy way to make frozen yogurt? I keep, year round, two or three kilos of fruit, peeled and chopped in half an inch cubes, in my freezer. 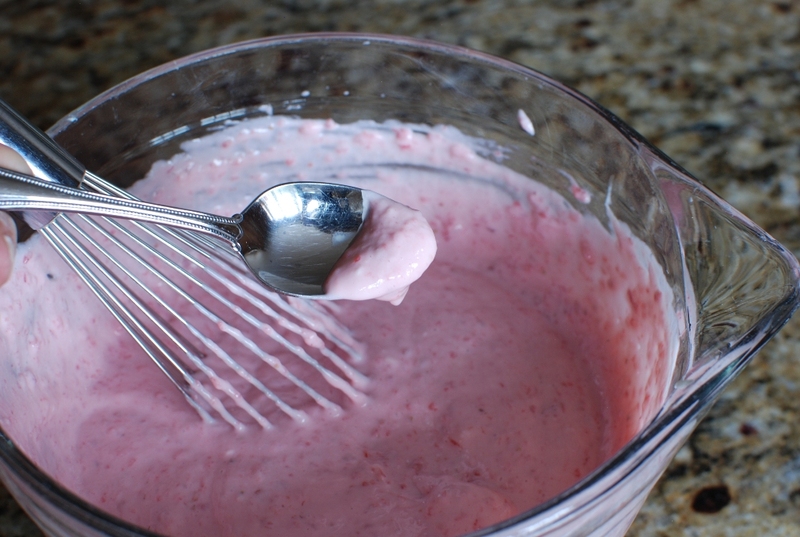 Then, anytime I want to eat yogurt, I blend 1 1/2 cup of stone-hard frozen fruit with 1 cup of yogurt. That's it. You should try the banana frozen yogurt with almonds, muscovado sugar and ground cardamom seeds! GREAT idea. That just sounds so delicious. I LOVE cardamom. I'll try it for sure.